Good quality sushi, Thai fare and Japanese hibachi dining are popular with the neighborhood's denizens. : Kobe House greets patrons warmly with an environment that is soothing and somewhat separated from the hustle of the surrounding shopping emporiums. An artful interior suggests the Japanese aesthetic, and there's a large American-style bar on one side while the hibachi or teppan spaces occupy the other side. 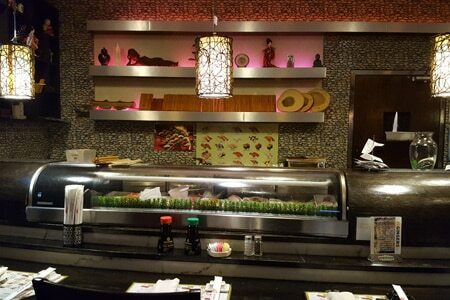 Banquette seating fills the center, and runs perpendicular to the sushi bar. Dim lighting will have you reaching for your cell phone to illuminate the menu. We found all dishes, even if somewhat standard, several notches above the usual in quality, starting with a very good sesame-seasoned crunchy seaweed salad and a Thai-style chicken satay. Fill in with selected sushi nigiri or sashimi for a fine light meal. Enjoy the teppan experience with the usual knife acrobatics. From the miso soup to the salad (crisp romaine rather than iceberg with house-made ginger dressing, some of which you'll want to take home) and the steak and scallops all cooked to order (we like our scallops slightly underdone), the dining is a value. The wine list is nothing to wax excited about but there are good beers and a few sakés. Desserts include mango sorbet. Servings are huge, so two people could consider plate sharing for a $6.95 upcharge, so each gets a soup, salad and dessert.